Hi everyone! Happy Wednesday, and thanks for joining me today! It's Cassie here, and I have a fun Lawn Fawn card for you today. I know what you're thinking...the weather is just turning to fall and I'm talking about winter. I'm being that crazy lady. 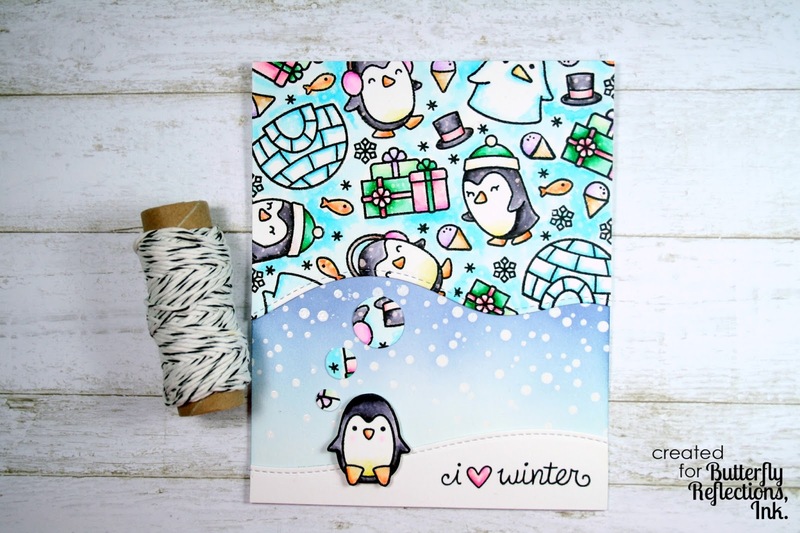 But honestly, I love thinking up some winter cards before the snow starts falling because it gets me in gear to send out cards on time! I'm absolutely adoring the new Snow Cool stamp set that Lawn Fawn just came out with. What I really love about it (aside from how dang cute it is!) is that it goes really well with the set from last year Toboggan Together. 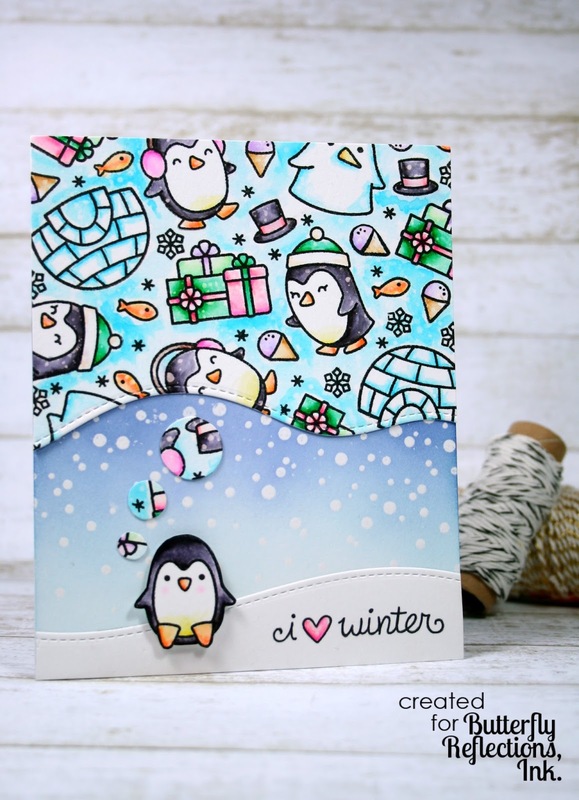 Both sets feature adorable little penguins and awesome scene building images. For this card I wanted it to look like this little penguin was daydreaming about all the fun things that he was going to do when winter finally arrived. I started the card by stamping a bunch of little images from each set onto a piece of Bristol smooth cardstock. I started with the larger images and filled in with the smaller images. Once I had stamped everything I went to town using my Zig Clean Color Real Brush Markers. I've been turning to these a lot lately because of how easy they are to use and how beautiful they always turn out. When everything was dry I cut down my piece and used the Stitched Hillside Borders dies to make the bottom wavy like a thought bubble. I colored the penguin in using the same markers as the other little images as well. Next I stamped the falling snow image from the Snow Cool set onto a A2 size card panel. I heat embossed it with white embossing powder, and used Chipped Sapphire and Tumbled Glass Distress Inks to blend a night time sky. 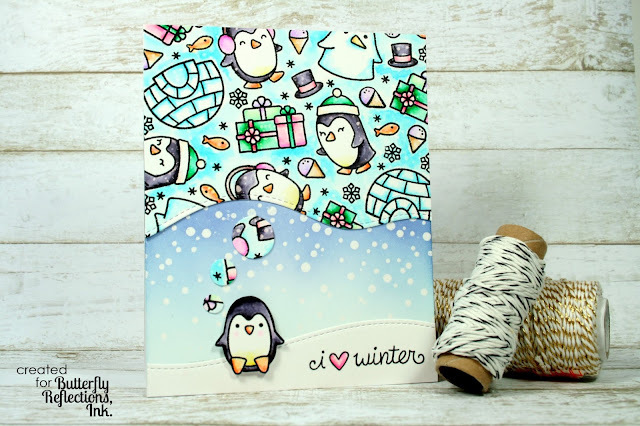 I cut another piece of the Bristol smooth cardstock with the Stitched Hillside Borders dies to make a snow mound for the penguin to sit on. To make the little thought bubbles coming from his head I simply traced small circles and cut them out of a scrap I had from the pattern I made for the day dream. I stamped my sentiment using the Yeti Set Go set, and colored in the heart using the same pink I had for the present. When everything was dry I put the card together using my fave liquid adhesive Tombow's Mono Multi Liquid Glue. I love this stuff because it gave me time to play around and make sure I had the placement just right before it set. And that's it for the card! Thank you so much for joining me on my first post as a Butterfly Reflections Ink design team member! I hope you have a great day and I'll see you soon with another card!